The U.S. city of Oakland, California is the site of more than 90 high-rises, the majority of which are located in its downtown district. In the city, there are 21 buildings taller than 200 feet (61 m). The tallest building is the 28-story Ordway Building, which rises 404 feet (123 m). The history of high-rises in Oakland began with the completion of the nine-story Bank of America Building in 1907. A nine-story section was later added to the same building. It remained the tallest building in the city until 1914, when the Oakland City Hall, at 320 feet (98 m), became the tallest. At the time it was built, the City Hall was the first high-rise government building in the United States and the tallest building west of the Mississippi River. The 390 feet (119 m) Kaiser Center surpassed the height of the City Hall in 1960, and was the tallest building for a decade. In 1989, Ordway Building became the tallest building in the city. As of January 2018[update], the tallest building currently under construction is the 40-story, 400 ft (122m) skyscraper at 1314 Franklin Street. Ordway Building is the tallest building in Oakland. Kaiser Center is the second-tallest building in the city. Clorox Building is the sixth-tallest building in the city. Oakland City Hall was the tallest building in Oakland from 1914 to 1960. The Tribune Tower is the 11th-tallest building in the city. 555 City Center, built in 2002, is the most recent high-rise constructed in the city. Ronald V. Dellums Federal Building complex is the seventh tallest along with EM Harris State Office Building. This lists ranks Oakland buildings that stand at least 200 feet (61 m) tall, based on standard height measurement. This includes spires and architectural details but does not include antenna masts. Existing structures are included for ranking purposes based on present height. An equal sign (=) following a rank indicates the same height between two or more buildings. Table entries with dashes (—) indicate that information regarding building is not known. The "Year" column indicates the year in which a building was completed or opened. 14 555 City Center 279 (85) 20 2002 37°48′13″N 122°16′31″W﻿ / ﻿37.80361°N 122.27528°W﻿ / 37.80361; -122.27528 Tallest building constructed in the 21st Century. This lists buildings that are under construction in Oakland and are planned to rise at least 50 meters (164 ft). This lists buildings that are approved in Oakland and are planned to rise at least 50 meters (164 ft). This lists buildings that are proposed in Oakland and are planned to rise at least 50 meters (164 ft). "Oakland". Emporis.com. Retrieved October 15, 2009. "Oakland". SkyscraperPage.com. Retrieved October 16, 2009. ^ "Oakland". emporis.com. Retrieved February 12, 2019. ^ a b c "Ordway Building". Emporis.com. Retrieved August 18, 2007. ^ a b c "Bank of America Building". Emporis.com. Retrieved December 25, 2007. ^ a b c "Oakland City Hall". Emporis.com. Retrieved August 18, 2007. ^ Fromm, Dorit (January 4, 1998). "Oakland and San Francisco's civic structures reinvent urban centers". San Francisco Chronicle. Retrieved October 15, 2009. ^ a b Burt, Cecily (October 15, 2009). "Oakland City Hall shines brighter after Loma Prieta earthquake". Oakland Tribune. Retrieved October 15, 2009. ^ a b c "Kaiser Center". Emporis.com. Retrieved August 18, 2007. ^ "Ordway Building". SkyscraperPage.com. Retrieved October 13, 2007. ^ "Kaiser Building". SkyscraperPage.com. Retrieved December 25, 2007. ^ "Lake Merritt Plaza". Emporis.com. Retrieved August 18, 2007. ^ "Lake Merritt Plaza". SkyscraperPage.com. Retrieved December 25, 2007. ^ "1111 Broadway". Emporis.com. Retrieved August 18, 2007. ^ "1111 Broadway". SkyscraperPage.com. Retrieved December 25, 2007. ^ "Kaiser Engineering Building". Emporis.com. Retrieved August 18, 2007. ^ "Kaiser Engineering Building". SkyscraperPage.com. Retrieved December 25, 2007. ^ "Clorox Building". Emporis.com. Retrieved August 18, 2007. ^ "Clorox Building". SkyscraperPage.com. Retrieved December 25, 2007. ^ "EM Harris State Office Building". Emporis.com. Retrieved August 18, 2007. ^ "Elihu M Harris State Office Building". SkyscraperPage.com. Retrieved December 25, 2007. ^ "Oakland Federal Building South". Emporis.com. Retrieved December 25, 2007. ^ a b "Federal Tower Buildings". SkyscraperPage.com. Retrieved December 25, 2007. ^ "Oakland Federal Building North". Emporis.com. Retrieved December 25, 2007. ^ "City Hall". SkyscraperPage.com. Retrieved December 25, 2007. 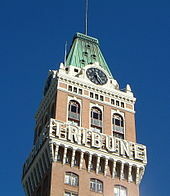 ^ "Tribune Tower". Emporis.com. Retrieved August 18, 2007. ^ "Tribune Tower". SkyscraperPage.com. Retrieved December 25, 2007. ^ "1330 Broadway". Emporis.com. Retrieved December 25, 2007. ^ "1330 Broadway". SkyscraperPage.com. Retrieved December 25, 2007. ^ "Pacific Bell Building". Emporis.com. Retrieved December 25, 2007. ^ "Pacific Bell Building". SkyscraperPage.com. Retrieved December 25, 2007. ^ "555 City Center". Emporis.com. Retrieved December 25, 2007. ^ "555 City Center". SkyscraperPage.com. Retrieved December 25, 2007. ^ "Park Bellevue Tower". Emporis.com. Retrieved December 25, 2007. ^ "Park Bellevue Tower". SkyscraperPage.com. Retrieved December 25, 2007. ^ "Park Bellevue Tower". Caldecott Properties. Retrieved November 19, 2009. ^ "St. Paul's Towers". Emporis.com. Retrieved December 25, 2007. ^ "St. Paul's Towers". SkyscraperPage.com. Retrieved December 25, 2007. ^ "100 Grand Avenue". Emporis.com. Retrieved December 25, 2007. ^ "100 Grand". SkyscraperPage.com. Retrieved December 25, 2007. ^ "Central Building". Emporis.com. Retrieved December 25, 2007. ^ "Central Building". SkyscraperPage.com. Retrieved December 25, 2007. ^ "Bank of America Building". SkyscraperPage.com. Retrieved December 25, 2007. ^ "Financial Center Building". Emporis.com. Retrieved December 25, 2007. ^ "Financial Center Building". SkyscraperPage.com. Retrieved December 25, 2007. ^ "SBC Building". Emporis.com. Retrieved December 25, 2007.